RESTON, Va. – In the December featured basic science article in The Journal of Nuclear Medicine, Belgian researchers report on the first large-scale longitudinal imaging study to evaluate BACE1 inhibition with micro-PET in mouse models of Alzheimer’s disease. PET imaging has been established as an excellent identifier of the amyloid plaque and tau tangles that characterize Alzheimer’s disease. Now it is proving to be an effective way to gauge treatment effectiveness. The tracer makes it possible to image the effects of chronic administration of an inhibitor for an enzyme, called beta (β)-site amyloid precursor protein-cleaving enzyme 1 (BACE1), which cuts off protein fragments that can lead to amyloid-β development and is more prevalent in brains affected by Alzheimer’s. It does this by binding to BACE1. The study compared control mice with those genetically-altered to have Alzheimer’s, and tested 18F-florbetapir (18F-AV45) along with two other tracers, 18F-FDG PET and 18F-PBR111. 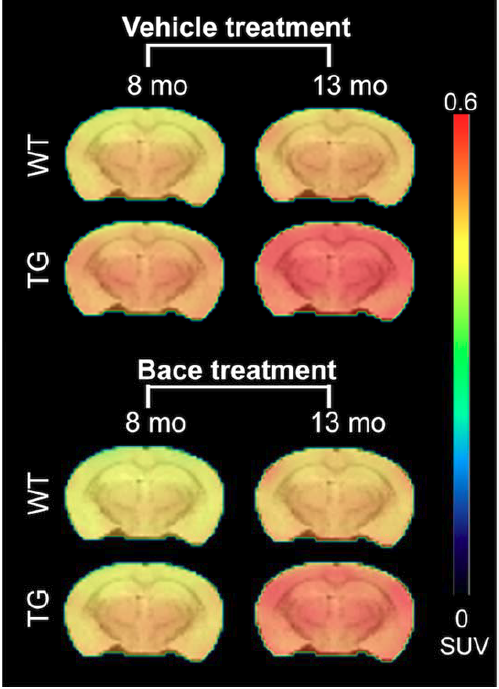 The mice received the BACE inhibitor at 7 weeks, then brain metabolism, neuroinflammation and amyloid-β pathology were measured using a micro-PET (μPET) scanner and each of the tracers. Baseline scans were done at 6-7 weeks and follow-up scans at 4,7 and 12 months. 18F-AV45 uptake was measured at 8 and 13 months of age. After the final scans, microscopic studies were performed. While all three tracers detected pathological differences between the genetically modified mice and the controls, only 18F-AV45 showed the effects of inhibitor treatment by identifying reduced amyloid-β pathology in the genetically modified mice. This was confirmed in the microscopic studies. The statistics on Alzheimer’s are sobering. Approximately 10 percent of people 65 and older have Alzheimer's dementia, according to the Alzheimer’s Association. More than 5 million Americans are living with the disease, and that number could rise to 16 million by 2050. Figure: Longitudinal PET imaging with 18F-AV45. PET imaging shows the average 18F-AV45 uptake per animal group at 8 and 13 months of age. A significant interaction of genotype treatment was observed in the cortex (p = 0.0248), hippocampus (p = 0.0071) and thalamus (p = 0.0084), indicating reduced [18F]-AV45 uptake in BACE1 inhibited transgenic mice. Credit: MICA, University of Antwerp, Belgium. Authors of “Evaluation of Small-Animal PET Outcome Measures to Detect Disease Modification Induced by BACE Inhibition in a Transgenic Mouse Model of Alzheimer Disease” include Steven Deleye, Ann-Marie Waldron, Jeroen Verhaeghe and Steven Staelens, Molecular Imaging Center, University of Antwerp, Antwerp, Belgium; Astrid Bottelbergs, Bianca Van Broeck and Mark Schmidt, Neuroscience Department, Janssen Pharmaceutica NV, Beerse, Belgium; Leonie Wyffels, Molecular Imaging Center, University of Antwerp, and Nuclear Medicine Department, University Hospital, Antwerp; Sigrid Stroobants, Nuclear Medicine Department, University Hospital Antwerp; and Xavier Langlois, Foundational Neuroscience Center, Abbvie, Cambridge, Massachusetts. The research positions of some of the study authors were funded by Antwerp University and University Hospital, Antwerp. An Agency for Innovation by Science and Technology (IWT) scholarship also helped support the study.